Feeling secure is the most wanted precious thing that everyone wants to have. Privacy and security are already in our cells. To encourage your need, WhatsApp messenger has the built-in feature in all the latest versions. WhatsApp encryption helps you to secure WhatsApp chats photos, videos, and other documents. When you and the other end has the latest version of WhatsApp installed on your device, end-to-end encryption will be turned ON automatically. The end-to-end encryption will be working on Group chats also. So there is no need to worry about losing privacy while using WhatsApp. 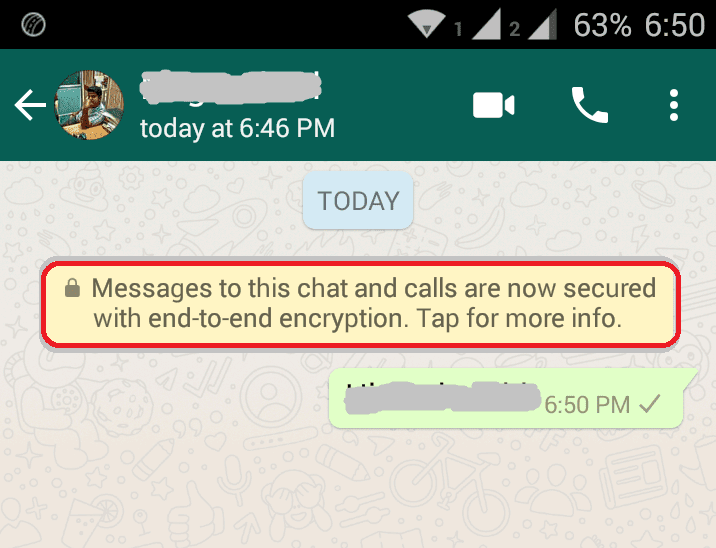 If someone who is using WhatsApp is unable to see the encrypted notification, he/she should upgrade their version of WhatsApp to the latest rolled out version. When end-to-end encrypted, no one can interfere with your chats. Even WhatsApp couldn't spy on your conversation. WhatsApp integrates the open source software called Textsecure which is created by a privacy and security-focused non-profit open whisper systems that secure the WhatsApp messages with a cryptographic key. This key can be accessed only by the user because this key can never leave from their device. This is very similar to protecting your doc or pdf files with a strong password. Most people searched for privacy secured apps for the secret conversation. So people started using other chat apps that provide encryption facility by going through a secret conversation option in the app. That time, WhatsApp doesn't have the encryption feature. 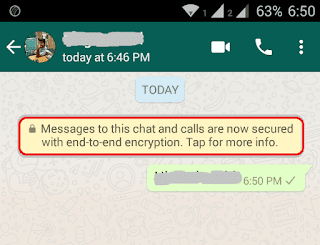 Later, in order to grab people's respect and most importantly to secure their chats, WhatsApp has officially released End-to-End encryption on the latest version. When you start a new chat, End-to-End encryption will be turned ON. WhatsApp does have a feature like turning OFF the encryption mode. Similarly, there is no option to turn it ON manually. With a Lock symbol, you could see a notification on the top of your chat. Each of your chats will be having its own unique security code. 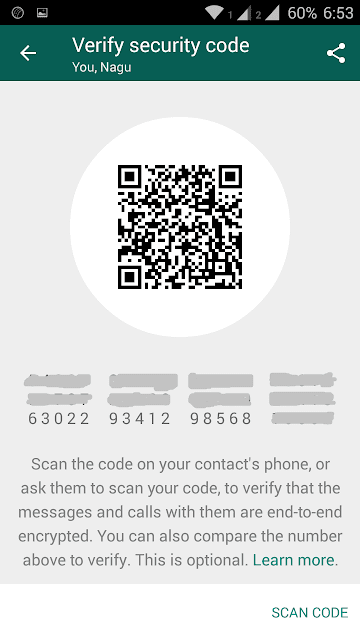 This code can be used to verify whether you and the other end chats are encrypted. For example: If you and your partner have connected for a chat, the security code assigned to both contacts will be the same. Tap on the contact you want to verify. Press the 3 dots on the top right corner of the contact. Then once again Tap on Verify security code option. Check the below screenshot for an example. If you want to scan your partner's QR code, tap on SCAN CODE option which is given at the bottom right corner of the security code screen. 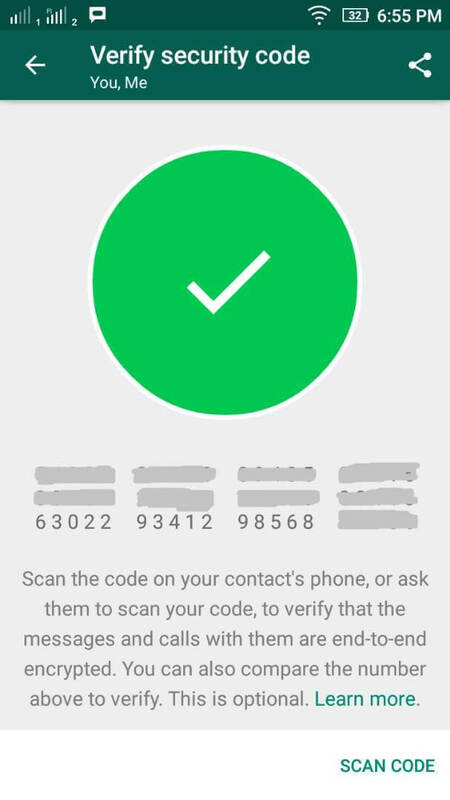 If your partner wants to scan QR code on your device, ask your nearby partner to follow the same procedure as mentioned above to scan the code. On scanning the code, a Green tick mark will appear as shown below. This shows that your chats are encrypted and no one can enter their nose into your conversation. To Verify via 60 digits visible key, note down the numbers. If your partner is not physically available, you can send the numbers to them. They have to compare the key with their key for a match. To share the QR code or 60 digits number to your partner, simply tap on share symbol on the security screen and choose a gateway like WhatsApp, Email, Facebook messenger, or any other chat apps. On sharing, your partner will receive both the QR code and 60 digit number. 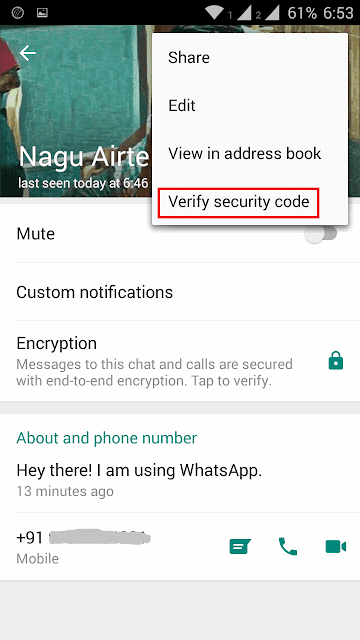 This is the best option to verify WhatsApp encryption when your opponent chatting person is physically unavailable. Note: If the QR code or keys don't match, you are comparing other chat's security code. 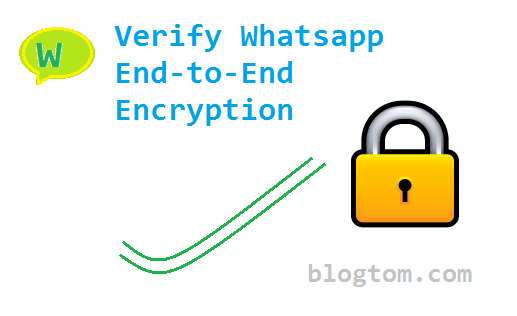 Since WhatsApp chat conversation is automatically encrypted, test the method mentioned in this post and have a little fun.